In an early experiment using a special air gun, particles were shot into aerogel at high velocities. Close-up of particles show them captured in this "magic material", leaving a carrot-shaped trail. Scientists confirmed today that the Stardust sample return capsule that parachuted to Earth last weekend achieved a mission goal of catching comet and interstellar dust particles. It might also have brought back traces of water tossed off from a comet. "This exceeded all of our grandest expectations," said Donald Brownlee, the mission's principal investigator from the University of Washington. "We were totally overwhelmed," he said, noting that "hundreds and hundreds and hundreds" of particle tracks have been brought back. Stardust scientists and curation experts cracked open the Stardust sample return canister Tuesday in a cleanroom facility at NASA's Johnson Space Center (JSC) in Houston, Texas. That day was a "magic moment," Brownlee said. "We were the first people in the history of the planet to see comet dust in hand," he reported today in a press briefing held at the center. Stardust's encounter and cometary dust sample collection at comet Wild 2 occurred Jan. 2, 2004, with the spacecraft flying by the comet at roughly 149 miles (240 kilometers) distance. Brownlee said more than a million particles larger than one micron (a millionth of a meter) in diameter are believed to have been captured. Scientists have already spotted a mineral grain from the comet, Brownlee said. 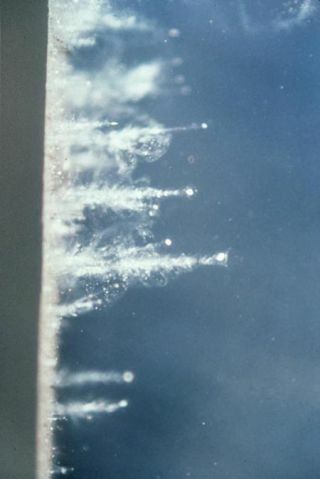 Both interstellar dust and comet particles were captured in aerogel, a material that is as much as 99.9 percent empty space, thus greatly reducing the stress of impact on the particles. The particles slammed into the aerogel at speeds six times faster than a rifle bullet. The aerogel was mounted within a two-sided tennis racket-like grid. "This is a realization of a 25-year dream to capture and return samples from a comet," said Peter Tsou, deputy principal investigator from the Jet Propulsion Laboratory (JPL) in Pasadena, California. The tiny samples from a distant comet will open giant windows to our past, he said. Among the scientific payoffs in studying the captured particles is appreciating the physics of comets and how they operate, said Michael Zolensky, Stardust curator and co-investigator at JSC. "We think much of the Earth's water and organics ... the molecules in our bodies, perhaps came from comets." "We don't know yet ... if we have some cometary water in some form preserved for analysis here," Zolensky added. The collection of particles brought back by Stardust is now safe on Earth for detailed study, not only for today, but for assessment by future generations of scientists using still-to-be developed tools and techniques, Zolensky said. Scientists will search the aerogel grid for dust samples, with more than 65,000 people having signed up to help in a project called Stardust@home in which home computers can be used to examine images of tiny sections of the aerogel grid to look for interstellar dust particles. Carlton Allen, astromaterials curator at JSC, said Stardust's success is a prelude to other possible specimen-gathering missions to comets, asteroids, as well as bringing back to Earth whiffs of Mars' atmosphere, bits of high-altitude martian dust, as well as rock and soil direct from the red planet's surface. First scientific results from the Stardust mission are to be ready for delivery at the Lunar and Planetary Science Conference to be held this March in League City, Texas. The 101-pound (46-kilogram) Stardust capsule parachuted to Earth in the pre-dawn hours January 15 at the Utah Test and Training Range (UTTR). After the capsule's recovery, a canister holding the interstellar and comet samples was removed in Utah for transportation to JSC. Stardust was launched on it nearly seven-year flight on Feb. 7, 1999 and is a NASA Discovery-class mission. This project, considered cheaper, better, and faster than more complex missions in the space agency's past, cost $212 million. JPL manages the Stardust mission for NASA's Science Mission Directorate in Washington, D.C. Lockheed Martin Space Systems, Denver, built and operated the spacecraft. JSC is home to the curation team and the facility where the Stardust particles are being stored and distributed to a worldwide community of scientists. Want to look over the shoulders of Stardust scientists? Here's a live view of the Stardust Cleanroom at the Johnson Space Center in Houston, Texas.